I’ve been dreaming of an all-homemade holiday. One where all gifts are made in the kitchen or someone knits me an afghan or some cashmere socks. Can you knit cashmere socks? I want a Norman Rockwell holiday, do those still exist? However, my kids long for video games, remote control cars and basketball hoops, what can I say, they are normal. Really, I need/want nothing (unless you count another tractor, fencing for my property and vineyard posts etc. ), I would be happy with all homemade gifts. I have always appreciated the jar of jam or cookies straight out of someone’s kitchen, it’s so much more meaningful to me. I do not need another “thing”. I came across these little sachets and thought they would be perfect to tuck into holiday cookie platters or give a set of three in a lovely mug. I am a sucker for mulled cider this time of year and love the way it makes the house smell. These would also be perfect place card holders at the holiday table. These little bouquet garni bags are perfect vessels for the spices as you can boil the bags right in the cider and remove the whole bag when done. No mess to clean up. Wrapping the spices in cheesecloth and tying with kitchen string would also work nicely. Cinnamon sticks, whole cloves, star anise and whole allspice is all you need. This would make a nice hostess gift. Place the cinnamon, star anise, allspice and cloves in the bag. Keep at room temperature for up to 6 months. Include these instructions with your gift: "Simmer 1 sachet in 2 quarts apple cider for 15 minutes. One bag serves 8. Have fun with these, they are always appreciated by the recipient. This recipe has also been included in a fabulous collection of 28 Homemade Gifts from Your Kitchen. Check it out if you are interested. Those are absolutely adorable. I would love to give these in sets of three, so cute. I also love gifts from the kitchen! The sachets are so appealing and would be very welcome here in our home. I know what you mean about gifts..I need nothing but do have a few wants. The gifts i truly cherish are the homemade or well-thought out ones that show someone really knows me enough to know what pleases me. That is a clue for me to do the same. Great post, and great idea for a present to tuck into a gift bag. This is brilliant, thx for sharing the idea…..I know exactly where I can find cheesecloth to make sachets……. Do you have to go to a “special” store for those spices? That website Sur La Table? is out of the bags but I checked and TARGET has them for 9.99. I was racking my brains for the quantities of spices to make mulled Apple juice, and then I found your blog. Thank goodness. I can make some this evening. Those sachets would certainly be great gifts and they smell of Christmas too. Maybe apple cider in place of wine… No brandy in the recipe though??? 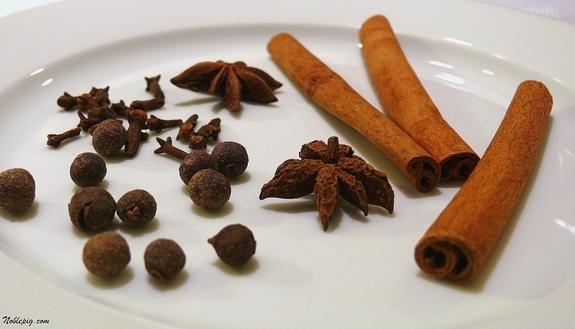 Use cinnamon or allspice to your taste. You can always add to, so start small. I use 2-3 big dashes right out of the shaker. 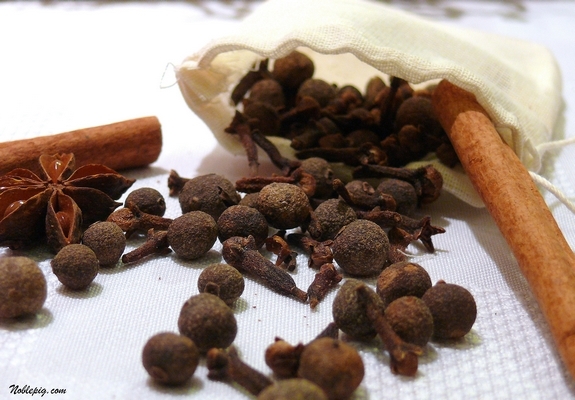 To that add two pinches of cloves, ground, or better, use tiny tea or spice pouch and add whole cloves to it-tie it well. Add tiny bit of rum, any kind, and coconut rum makes this even better. If you love something like mango or pineapple, use chopped fresh fruit or a few prices of dried or candied fruit. Finally throw in a dash of ginger, and grated orange rind or few tblspoons of orange juice. Try it, then add to it. Let simmer on low or add straight to your liquid. If you’re not heating, you’ll. need longer for the flavors to mix. We used to make it with Tang, so you’d have all dry ingreds that you’d just spoon a few tbls into your base liquid, like a good red wine. You can put this dry mix into a little sachet, if you used dry mix like Tang, and attach to a mug or to a gift basket. The pieces of candied or dried fruit fill out the sachets, smell great, and look cute. Love this idea! And the little sachet bags. I was in need of something like this when I was cooking for thanksgiving. I ended up using a coffee filter, filling it with spices, and then stapling it shut. Not the most elegant, but totally functional. Absolutely brilliant idea! I can just smell it bubbling away on the stove…oh wait, I’m supposed to make these and then give them away? *lol* Not sure all of them would make their way to other homes. This is an awesome gift idea. We, too, are leaning towards homemade gifts this year. I was thinking granola or hot fudge sauce, but these look pretty and are so easy! No, these spices are sold everywhere. cath I have to share a funny story with you about these. we had a mouse die in the walls of the house we are in. and as you know the smell was awful. one of my clients told me to make one of these and let it sit on the stove and it will help get rid of the smell. it did, we did it for a few days until the smell was gone. These are downright darling, I am really cute. I think I’ll make some for my Bunco group. I love this! What a great idea for a hostess gift. Thanks. Ooh, me too! I am always in need of gifts for teachers and co-workers and neighbors…these would be great! I wish someone would give me homemade gifts, but I seem to be the only one who makes them around here, oh well! Nice idea! Your photography just keeps getting better and better. I would love to get those as a gift!! I love the giving and receiving of handmade gifts too. Each year I try to give a couple, not sure if I’m going to succeed this year, unless I get busy! I LOVE these! I’m like you, I love giving homemade gifts and I love receiving homemade gifts. Unfortunately, most of us don’t start early enough to make something homemade for everyone on our list. My neighbors always get homemade treats. Something like this would be perfect! 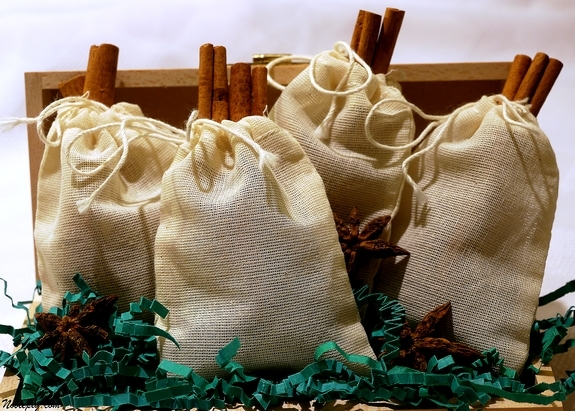 Oh, oh, oh, I’m sure these little spice bags would make a delicious spiced wine too. Lovely gift idea. What a great idea. These would be wonderful “token” gifts to have on hand for drop-ins during the holiday. You always have such great ideas and are generous in sharing them with us. What a cute idea. If I can find those little bags already made then I’m all over this one this year! I love mulled cider, particularly with a shot or two of rum in it! Brandy works nicely too. I found found that when I want to steep small spices, that a tea ball works pretty well. It doesn’t hold a cinnamon stick, but those are easy enough to fish out. I want a Norman Rockwell Christmas too! Okay, maybe I sometimes want non-homemade gifts, but I do want lots of pretty decorations (that don’t include cartoons or movies or TV shows) and home cooked dinners that blow the guests away. I’ve been longing for that more and more as the years go and and yet most years I don’t even have the time and money to buy a tree. This year at least, I’m getting a tree. In fact, I’m going tree shopping tomorrow! When I saw the Anise stars at Safeway yesterday, I realized how silly my question was….oh well. I love to make homemade goodies for gifts. Last year I made ginger pear jam and scones mixes with recipes. Everyone loved that they were made from home. This is just lovely especially in the pretty bags. Your photos are terrific as well. Thanks so much Cathy. I love your ideas here, especially for the chai! And, by the way. . . you can make cashmere socks, what a great idea! I’ve never had mulled cider. OMG–I love this idea too! And I love mulled cider–we’ve been drinking a lot of it around here! thanks for showing us the Mulled-Cider Sachets in a different way, that is really a great idea, keep it up. I offers Online Free Astrology, Career Report, Pure psychic reading, Love and Marriage solutions, Simple love spells, spells magic, Protection spells, Money, Guaranteed love, Marriage spells, Vedic Pooja online In India by me. I’ve just finished my 8th pair of socks, 5th beanie, and about to bind off my first pair of fingerless gloves…been stockpiling those homemade gifts. No cashmere though…wonder how it wears? 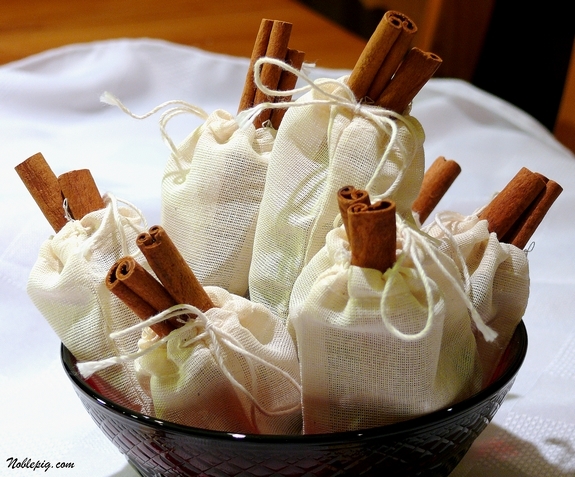 Mulled cider sachets are a great idea! We love home-made gifts! If you look in the “ethnic” section of your supermarket, you should be able to find these spices sold in cellophane bags much cheaper than in the regular spices section.